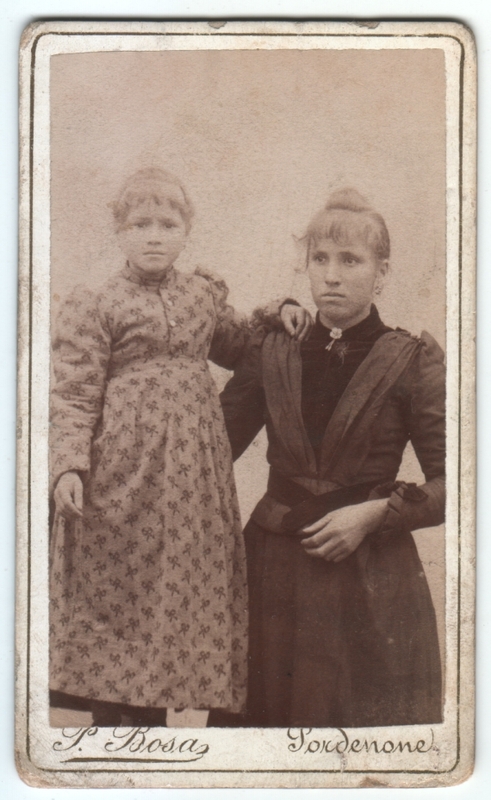 Carte de visite (CDV) measuring a bit more than 2.5 x 4 inches. Photographer is Bosa Pio of Pordenone (“Premiato Studio Artistico Fotografico”). Card printed by F. (?) D. (?) Sirtoli – Milano. Otherwise undated and unidentified. Shall we assume mother and daughter? Although this is ostensibly a studio portrait, it looks to me like it was taken outside in the sun. (Photographers sometimes employed natural light with a skylight, but somehow this feels outdoors to me. Of course, I could easily be wrong.) It seems Pordenone is both a province and a township in northeastern Italy. I’d vote that this is the town, but perhaps one of my Italian readers would know better. Also, the cardboard backing, printed with the fancy advertising of the photographer, includes a tiny name printed at the bottom, which I understand to be the printer of the cardboard backing itself. The first two initials of the name are unfortunately rubbed to near illegibility at this point, but it’s interesting to me that the card came all the way from Milan. A cursory internet search turned up neither the photographer nor the printer, but in ideal cases it’s possible to use both to help date the photo, since the photo would have to have been produced during the time when both businesses were in operation. Certainly looks like unfiltered sunlight to me too. Hi Ella, thank you for confirming what I suspected. And thanks for the link to that wonderful site! It’s very interesting, even though I don’t speak Italian.